Now that the warm weather has finally thawed New York’s frozen core and melted away everyone’s collective doldrums, it’s time for the city’s countless music festivals to start popping up, and one of them – perhaps one of the city’s most unique – is about to hit this Thursday night. 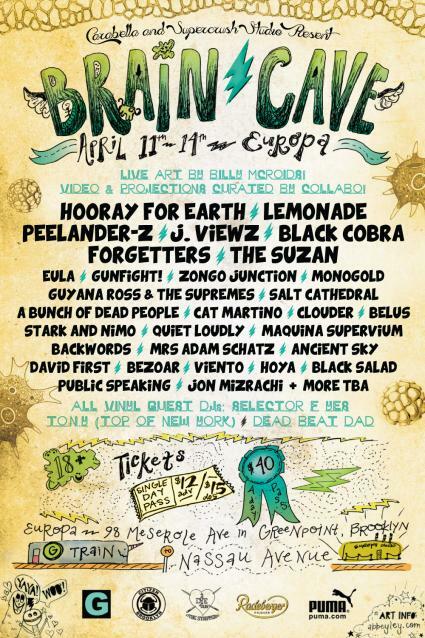 The Brain-Cave Festival, now in its third year and taking place at Europa in Greenpoint from April 11 - 14, bills itself as something of a music and multimedia extravaganza, and will feature a ton of NYC acts like Hooray for Earth, Peelander-Z, Lemonade, The Suzan, Monogold, Eula, Zongo Junction, Forgetters (mems. of Jawbreaker/Jets to Brazil/Against Me!) GunFight!, Quiet Loudly and more, plus live art, video projections, DJs and other surprises (not to mention an open bar each night!). For festival founder Luis Velasquez (CaraBella Presents) and co-producer Gabo Rodriguez (Supercrush Studio), Brain-Cave is a chance to showcase a wide variety of musical acts alongside art – a combination of ear and eye-candy guaranteed to mess with your senses and rattle your own brain cave. The festival has grown exponentially since its humble beginnings at Shea Stadium in 2011 and its stint at the Bell House last year, and now boasts four nights of music and art. For only $12 a night (or $40 for the whole festival - advance pricing), you’ll get four days of Brain-Cave, including a day show at the Greenpointers.com Spring Market on Saturday. Get more info on the fest here.